Don't you want a convenient SVNClient for Linux? Why no one make it, for a long time? I think someday it becomes as convenient as famous SVN Client for Windows. 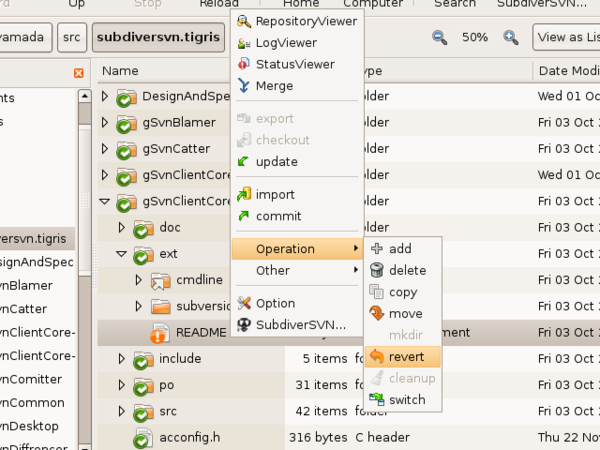 Subversion client for Linux with GTKmm library. SubdiverSVN was called ToytoiseSVN before. However, I thought that the users will misunderstand. Then, I renamed it to SubdiverSVN. And look on the Web site.